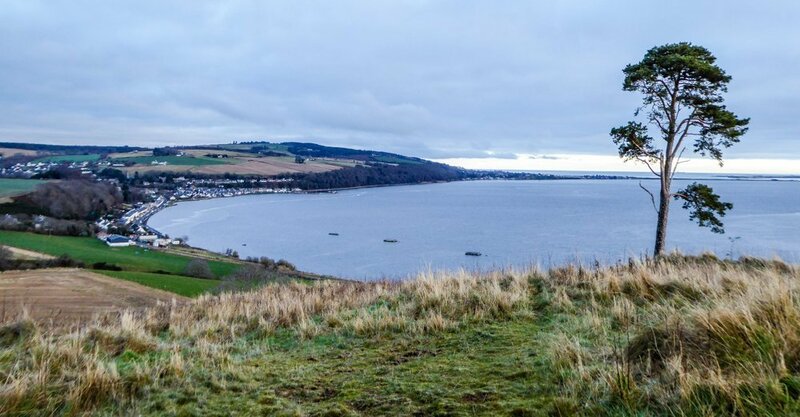 This is a lovely, short, circular walk from the little fishing village of Avoch (pronounced Ock) on the Black Isle. To attempt this walk you will need to be reasonably fit and steady on uneven ground, and you will need walking boots as part of the route is often muddy or wet underfoot. Don’t expect to see a glorious castle or you will be disappointed! However, there is a memorial cairn at the top of the mound which marks the spot of Ormond Castle built by the De Moray family in the twelfth century, which was once the largest castle in the Highlands. The views across the Moray Firth and across the rolling hills of the Black Isle make this a really worthwhile effort on a clear day (as can be seen from the image above). From Inverglen Guest House take the A9 North, and shortly after crossing the Kessock Bridge, take the right turn towards Munlochy and Black Isle attractions. Continue on the road, through Munlochy village (you will pass the Allangrange Arms in Munlochy – great pub food, so remember this for your journey back!) until you get to a T junction where you will turn right towards Avoch. As you approach Avoch take the right turn down towards the seafront (Long Road). When you get to the seafront at Avoch Bay, turn right again and continue to the end of the houses, where the road turns and starts to head uphill again. You should find parking spaces outside the houses. Start by walking up the hill on the minor road away from the bay between the national speed limit signs – don’t take the road off to the right which leads to a small group of houses. After a short walk up the hill you will see a wooden footpath sign for Ormond Castle & Avoch Circular walk. Turn left along the farm track towards Castleton Farm. As you approach the farm you will see 3 gates on the left. Take the middle gate which leads to a grassy (often muddy) path between the fields. The path is a gentle climb up around the castle mound. As you get to the rear of the mound go through another gate, where there is a sign giving information about Ormond Castle, and follow the path that leads up to the top of the mound and the castle remains, cairn and flagpole. There are great views across the farmland, across to Avoch village and across the Moray Firth. Return to the entry gate at the bottom of the mound, and continue along the track to the right, into the forested area. Whilst the views of the Moray Firth are obscured by trees you will be entertained by the birdsong as you walk slowly downhill. As the main track leaves the wooded area, the path starts to slowly ascend and there are fields and a view of Munlochy bay on the left hand side. At the end of the track is a gate, where you turn right onto a tarmac lane. Continue until you get to a junction with a minor road, where you turn right again, and walk downhill until you return to your starting point. Distance is approximately 3 miles or 4.7km, and the round walk will take between 1 – 1½ hours. We enjoyed this walk in January, so bear that in mind when you look at the photos (below)! Copyright © 2019 Inverglen Guest House. Powered by WordPress. Theme: Spacious by ThemeGrill.